Description: Department of Civil Engineering, School of Civil and Mechanical Engineering, Curtin University, Perth, Western Australia. Reduction of rainfall and runoff in recent years across South West Western Australia (SWWA) has drawn attention about climate change impact on water resources and its availability in this region. 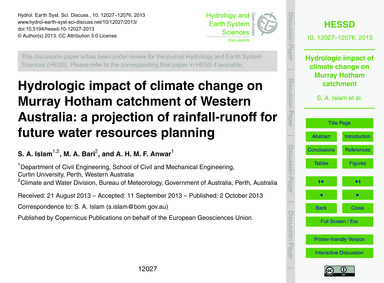 In this paper, hydrologic impact of climate change on Murray Hotham catchment in SWWA is investigated using multi-model ensemble approach. 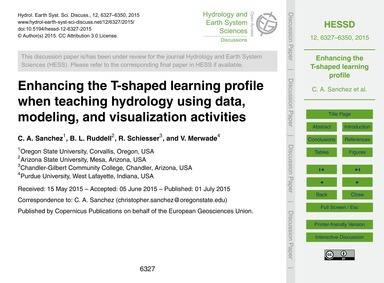 The Land Use Change Incorporated Catchment (LUCICAT) model was used for hydrologic modelling. 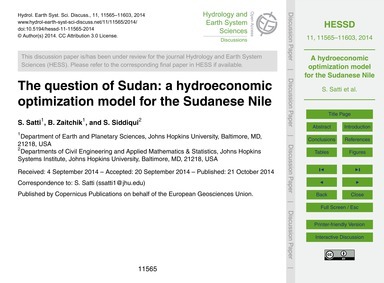 Model calibration was performed using (5 km) grid rainfall data from Australian Water Availability Project (AWAP). 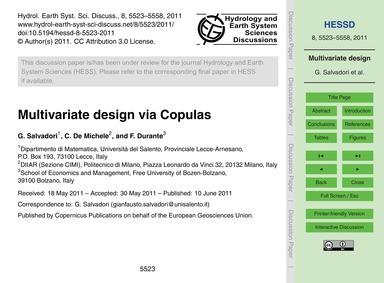 Downscaled and bias corrected rainfall data from 11 General Circulation Models (GCMs) for Intergovernmental Panel on Climate Change (IPCC) emission scenarios A2 and B1 was used in LUCICAT model to derive rainfall and runoff scenarios for 2046–2065 (mid this century) and 2081–2100 (late this century). The results of climate scenarios were compared with observed past (1961–1980) climate. The mean annual rainfall averaged over the catchment during recent time (1981–2000) was reduced by 2.3% with respect to observed past (1961–1980) and resulting runoff reduction was found 14%. Compared to the past, the mean annual rainfall reductions, averaged over 11 ensembles and over the period for the catchment for A2 scenario are 13.6 and 23.6% for mid and late this century respectively while the corresponding runoff reductions are 36 and 74%. For B1 scenario, the rainfall reductions were 11.9 and 11.6% for mid and late this century and corresponding runoff reductions were 31 and 38%. Spatial distribution of rainfall and runoff changes showed that the rate of changes were higher in high rainfall part compared to the low rainfall part. Temporal distribution of rainfall and runoff indicate that high rainfall in the catchment reduced significantly and further reductions are projected resulting significant runoff reductions. A catchment scenario map has been developed through plotting decadal runoff reduction against corresponding rainfall reduction at four gauging stations for observed and projected period. 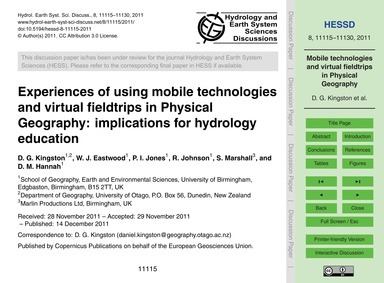 This could be useful for planning future water resources in the catchment. 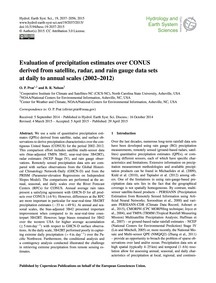 Projection of rainfall and runoff made based on the GCMs varied significantly for the time periods and emission scenarios. Hence, considerable uncertainty involved in this study though ensemble mean was used to explain the findings. Anwar, F. A. M., Bari, M. A., Want, R. M., and Islam, S. A.: The effect of climate change on stream flow reduction in Murray–Hotham river catchment, Western Australia, Sustainable Water Solutions for a Changing Urban Environment, IWA-6175, Singapore, 4–8 July 2011.; Arnell, N. W.: Uncertainty in the relationship between climate forcing and hydrological response in UK catchments, Hydrol. Earth Syst. 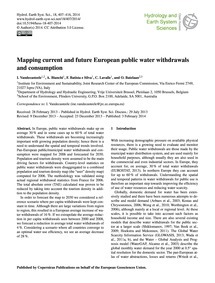 Sci., 15, 897–912, doi:10.5194/hess-15-897-2011, 2011.; Bari, M. A. and Ruprecht, J. K.: Water yield response to land use change in south–west Western Australia, Salinity and Land Use Impacts Series Report No. 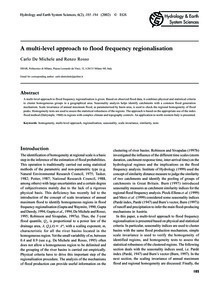 SLUI 31, Department of Environment, Perth, Western Australia, 2003.; Bari, M. A. and Smettem, K. R. J.: Development of a salt and water balance model for a large partially cleared catchment, Austral. J. 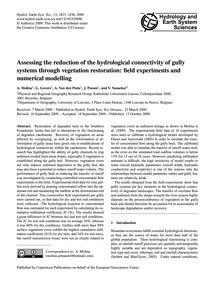 Water Resour., 7, 83–99, 2003.; Bari, M. A. and Smettem, K. R. J.: A daily salt balance model for stream salinity generation processes following partial clearing from forest to pasture, Hydrol. Earth Syst. 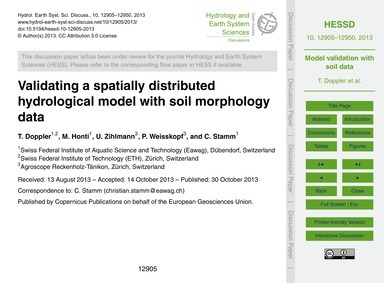 Sci., 10, 519–534, doi:10.5194/hess-10-519-2006, 2006.; Bari, M. A., Berti, M. L., Charles, S. P., Hauck, E. J., and Pearcey, M.: Modelling of streamflow reduction due to climate change in Western Australia: a case study, MODSIM 2005 International Congress on Modelling and Simulation, Modelling and Simulation Society of Australia and New Zealand, Melbourne, 12–15 December 2005, 482–488, 2005.; Bari, M. A., Shakya, D. M., and Owens, M.: LUCICAT Live – A modelling framework for predicting catchment management options, 18th World IMACS Congress and MODSIM09 International Congress on Modelling and Simulation, Cairns, Australia, 13–17 July 2009, 3457–3463, 2009.; Bari, M. A., Amirthanathan, G. E., and Timbal, B.: Climate change and long term water availability in south-western Australia – an experimental projection, Practical Responses to Climate Change National Conference 2010, Hilton on the Park, 180–188, Melbourne, Australia, 29 September–1 October 2010.; Bates, B., Hope, P., Ryan, B., Smith, I., and Charles, S.: Key findings from the indian ocean climate initiative and their impact on policy development in Australia, Climatic Change, 89, 339–354, doi:10.1007/s10584-007-9390-9, 2008.; Beeston, G. R., Hopkins, A. J. M., and Shepherd, D. P.: Land-use and vegetation in Western Australia, Resource Management Technical Report no 250, Department of Agriculture and Food, Perth, Western Australia, 2002.; Candela, L., Tamoh, K., Olivares, G., and Gomez, M.: Modelling impacts of climate change on water resources in ungauged and data-scarce watersheds. Application to the Siurana catchment (NE Spain), Sci. Total. 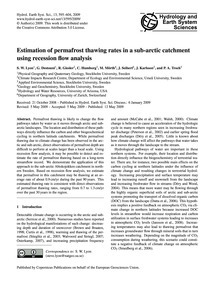 Environ., 8, 253–260, doi:10.1016/j.scitotenv.2012.06.062, 2012.; Commonwealth Scientific and Industrial Research Organisation (CSIRO): Surface water yields in south-west Western Australia, a report to the Australian government from the CSIRO south-west Western Australia sustainable yields project, CSIRO water for a healthy country flagship, Commonwealth Scientific and Industrial Research Organisation, Australia, 171 pp., 2009.; Coulibaly, P.: Multi-model approach to hydrologic impact of climate change, From Headwaters to the Ocean, Hydrological Change and Water Management – Hydrochange 2008, 1–3 October 2008, Kyoto, Japan, 249–255, 2008.; Cherkauer, K. A. and Sinha, T.: Hydrologic impacts of projected future climate change in the lake michigan region, J. 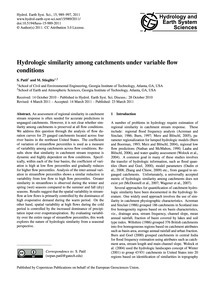 Great Lakes Res., 36, 33–50, 2010.; Chiew, F. H. S.: Estimation of rainfall elasticity of streamflow in australia, Hydrolog. Sci. 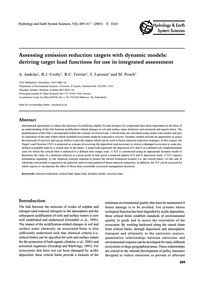 J., 51, 613–625, doi:10.1623/hysj.51.4.613, 2006.; Chiew, F. H. S., Whetton, P. H., McMahon, T. A., and Pittock, A.